Dutch writer; born in London Sept. 18, 1819; died at The Hague March 9, 1879. He went to Holland in 1838 as teacher of English, first at Arnhem, and then at the Military Academy at Breda; and he studied Dutch literature at Utrecht University (D.Litt. 1854). He was inspector of schools in South Holland from 1865 until his death. 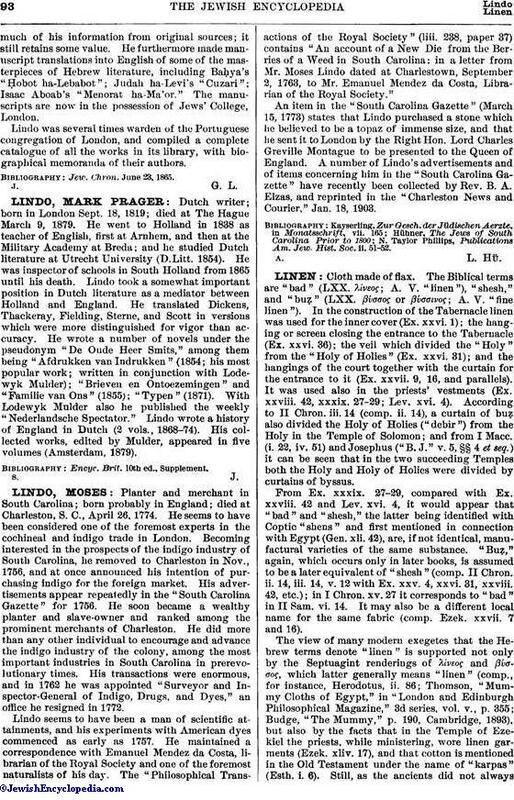 Lindo took a somewhat important position in Dutch literature as a mediator between Holland and England. He translated Dickens, Thackeray, Fielding, Sterne, and Scott in versions which were more distinguished for vigor than accuracy. He wrote a number of novels under the pseudonym "De Oude Heer Smits," among them being "Afdrukken van Indrukken" (1854; his most popular work; written in conjunction with Lodewyk Mulder); "Brieven en Ontoezemingen" and "Familie van Ons" (1855); "Typen" (1871). With Lodewyk Mulder also he published the weekly "Nederlandsche Spectator." Lindo wrote a history of England in Dutch (2 vols., 1868-74). His collected works, edited by Mulder, appeared in five volumes (Amsterdam, 1879). Encyc. Brit. 10th ed., Supplement.